Thanks to Proverbs 31:27, “She watches over the activities of her household,” I now realize that I am not supposed to do everything. Through the “Let.It.Go.” study, I have come to discover that things around the Whitaker household do not have to be done my way. With five children, there has to be some sort of order in our house. Therefore, every week I sit down with the kids and they take turns selecting their assigned chores for the week. Some of the jobs are daily and some are just once a week – around their schedule (within reason). The magnetic chore chart that we use has pictures, so even our four-year-old knows what each job is and what her tasks are for the week. I am learning to let go of the need to have the perfect house. I would rather my children have memories of a home – somewhere safe, comfortable enough to be themselves and relax. Things are not put off entirely, but there are more important things in my life. Don’t miss out on time with friends and loved ones to make everything perfect, some things can wait. Speaking of which, I need to go, it’s time to play. I challenge you to let go around your house this week. Tell me what you let go this week. I will check back later. I look forward to hearing from you. I love the idea of letting them all pick their own chores every week. I’m definitely going to have to try this. Thanks for the idea. I love the statement you made about letting the home be a safe haven for them to just be themselves. I think that is a very insightful statement and one I hope to accomplish also! Thanks for all your input, with five children you must be super busy and very organized to find time to do this as well! Bless you! THanks for the reminder that everything does not have to be perfect. I am guilty of not having a plan yet expecting things to get done:( I need to get me one of those magnetic chore charts! Thanks for the reminder that there are more important things. I am guilty of not having a plan and then expecting my family to read my mind. I am going to get a chore chart! I am the same way about my home. I used to be hard on my boys and want them to keep everything clean and neat. One day I decided that my boys were only going to be little once, my house will get clean when time permits. i am not married nor do I have children. Currently I share rent with my step sister Kathy. it is difficult living with anyone but I think its more difficult living with someone who is OCD and a germaphobe. Talk about controlling. (Being a germaphobe and OCD must not mean you keep things clean constantly because she doesn’t.) She will leave dishes in the sink and trash left laying around the house. Often has several half full trash-bags also. Each of which has trash separated into certain categories that also are separated by smaller bags put into the trash. Which likely stays in the Kitchen for at least a week long. Anyway, If I pick up and clean up behind her she doesn’t like it much. She says although nicely that she will do those things and it will remain that way for some time until she does do those things. She had some zip-lock bags in the trash can although not in a trash bag. Naturally when I took the trash out I also grabbed those bags and put them in the trash. Which is a dumpster in our apartment complex. Anyway, while at work she texted me about those bags. I don’t know if she felt she put something in them that she didn’t want to trash and realized this later or what but it made things tense in our house. As does leaving dirty dishes and Clorox wipes laying around annoys me. I wish she would just throw them away already and if I do not get upset. That is something I have to let go of at this moment. Because i will often do something that will upset her and she will do things that upset me as well. 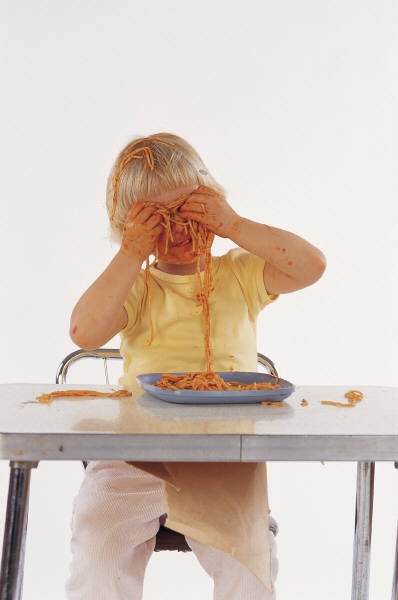 Jamy, I love the pic of the cute spaghetti faced kid! I actually have a pic of two of my girls similar to this! Which is why I wonder HOW I started to control more, when I didn’t before. Me getting older or the girls growing up? Idk! Still trying to figure it out! I’ve tried the chore chart thing too and just can’t seem to figure that out either. Find myself doing more because I “do over” their chores or just think I’ll get it done faster myself. I know this is not teaching them to be responsible though. Keeping an eye out over some of these blogs to soak it all up and learn!! Thanks Jamy! I like the idea of them picking their chores. Our kids do chores, but I have been not great about keeping charts in the past. I am really going to try to find a system that works for me. Will you pray about for me? Love and appreciate you! Sue, I would be glad to pray for you. May God direct you and give you the knowledge you need to select a system that will work for your family. I have no children but my 86 year old Mother lives with me as do my 3 dogs. With the rainy season upon us and my tile floors being white, I have learned that I cannot keep these floors clean! I do try to mop once or twice a week but cannot do it more often as time doesn’t allow. I work full time and also sell real estate which is a full time/part time job as well. Thanks for sharing your blog. I enjoy reading it.